The Juncaceae, the rush family, is a family of rather small plants that often look like a type of grass. They often grow on wet, infertile soils. There are about 400 species organised into eight genera. 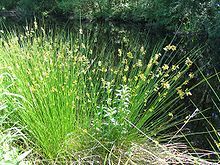 Juncus is the most well-known and largest genus in the Juncaceae family. They are part of the monocot flowering plant families, which means that their seeds only have one leaf to start off new growth. Rushes are found all around the world. They are commonly found in wet marshy areas, as the plant prefers moist soil. However, seedlings can survive dormant once well established even in the driest of places. Seeds spread by water or birds and other animals. They can live for up to 50 years lying dormant in droughts. Rushes is a basic food of many animal diets. They are also used as bedding and nesting material for many different types of birds and mammals. Rushes have been used throughout history by humans for various purposes such as weaving matts, medicine and animal feed. Today they are still used in some places for making sleeping mats but are mostly used as a decorative plant around ponds. ↑ Angiosperm Phylogeny Group (2009). "An update of the Angiosperm Phylogeny Group classification for the orders and families of flowering plants: APG III" (PDF). Botanical Journal of the Linnean Society 161 (2): 105–121. doi:10.1111/j.1095-8339.2009.00996.x. http://www3.interscience.wiley.com/journal/122630309/abstract. Retrieved 2013-06-26. This page was last changed on 14 February 2014, at 10:01.